The Amazon Fire Stick or Amazon Fire TV Stick connects you to a world of online entertainment. The new Amazon Fire TV Stick is a large black dongle, which hooks into your TV and provides 4K HDR streaming contents at your normal LED TV. In other words with the help of latest Amazon Fire TV Stick you can convert your normal LED TV in to WiFi LED TV. With 2000+ apps, watch thousands of movies and TV shows on HDTV. The all-new Alexa Voice Remote can easily find, play, and control content. Simply say “Alexa, find thrillers” and Alexa will show you results. 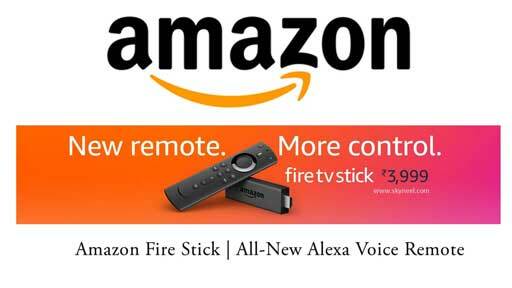 Amazon Fire TV stick comes with new remote with more controls and priced at Rs. 3,999 only. The main difference between it and the previous version is the addition of power, volume and mute buttons on the remote control with updated alexa voice feature. The online marketplace has started taking pre-orders for the new offering. If you want to buy Amazon Fire TV Stick then just click on New Amazon Fire Stick TV. The Amazon Fire TV Stick has a little USB-size stick with an HDMI port that plugs into your TV. Now, you can easily streams movies, TV shows and music from Amazon Prime, Netflix, Hulu, YouTube, Amazon Prime, Spotify and from other sources. Now you can control your compatible TV with dedicated power, volume, and mute buttons. Just press and ask Alexa to easily find, play, and control movies and TV shows. If you have Prime membership then, you can unlock thousands of movies and TV episodes on Prime Video, including Prime Originals like The Marvelous Mrs. Maisel and Breathe. Plus, enjoy millions of songs, ad-free with Prime Music. Amazon Fire TV stick is powered by Quad-core ARM 1.3 GHz processor with Mali450 MP4 GPU, 8GB internal storage capacity. The dimension of this device measured in 85.9 x 30.0 x 12.6mm with 32g weight. If we talk about the connectivity options, include Dual-band, dual-antenna Wi-Fi supports 2 x 2 MIMO 802.11a/b/g/n/ac, Bluetooth 4.1 + LE. The latest Amazon Fire TV Stick comes with all-new Alexa Voice Remote included or free Fire TV Apps. You can get 720p and 1080p up to 60 fps output resolution support. When you unboxing the pack you will get a Fire TV Stick, Alexa Voice Remote, USB cable and power adaptor, HDMI extender, 2 AAA batteries and Quick Start Guide. You can view live camera feeds on your TV or control lights, smart plugs, switches, and other compatible smart home devices with your Alexa Voice Remote. Just ask Alexa. For eg: If you want to find comedies just say “Alexa, find comedies”. To watch Padmaavat movie just say “Alexa, watch Padmaavat”. To rewind running video or movie 10 seconds back just say “Alexa, rewind 10 seconds”. Step 1: Plug Fire TV stick into your HDTV (HDMI port). Plug the charger into a wall socket. Step 2: Connect to WiFi and enjoy online entertainment. This is most powerful streaming media stick. Latest Fire TV stick is over 80% more powerful than previous version and one of the best-selling Fire TV Stick. Launch and control content with the next-gen Alexa Voice Remote. Use the dedicated power, volume, and mute buttons to control your TV. Enjoy brilliant picture and immersive sound with access to 4K Ultra HD, Dolby Vision, Dolby Atmos, HDR, HDR-10, HLG, and HDR-10+. Choose from thousands of movies and TV episodes. Enjoy favourites from Prime Video, Hotstar, Netflix, Zee5, Sony LIV, and others. Experience thousands of apps, Alexa skills, and millions of websites like YouTube, Facebook, and Reddit. Do more with Alexa—view live camera feeds, check cricket scores, order food, and stream music. Amazon Prime members get unlimited access to thousands of movies and TV episodes, plus ad-free listening to millions of songs with Amazon Prime Music.